Whether you shoot at 100 yards or 1000, you need to gauge the wind to shoot small groups. A flag or wind-sock will show you the angle of the wind, but you’ll still be guessing about its velocity. That’s where a hand-held wind gauge helps. A good gauge provides both current and averaged wind speed plus basic environmental info (such as temperature and wind chill). To get these features you can pay hundreds of dollars. 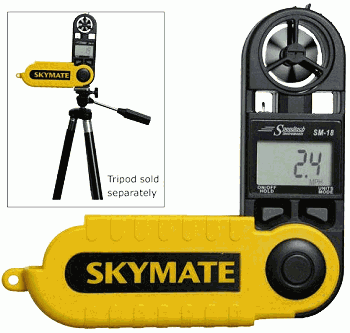 Or, you can buy a Speedtech Skymate SM-18 Wind Meter from Officetronics for just $55.00. (If Officetronics is sold out, try this vendor link at $58.66.) The Skymate is a quality product sold by many of the big name vendors (Cabela’s, MidwayUSA) for $90.00 or more. The Skymate Wind Meter is accurate, rugged, water resistant, and affordable. This compact unit weighs just 2.3 ounces, and has a replaceable 400 hour lithium battery. “Smart” features include a data lock function, and an automatic power shutoff that kicks in after 15 minutes to save your battery. Share the post "Bargain Bin — $55.00 Wind Meter"